i believe csqc allows for wall walking. theres a movetype for it. wallwalking is an fte-specific feature. it does not require csqc, but it does not exist in DP. 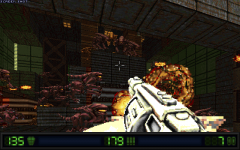 you can find an fte-specific mod with monsters walking on the ceiling here: http://triptohell.info/moodles/junk/pourtall.pk3 (source is inside, you can use the grabber gun to pick up monsters and stick them on walls). disclaimer: its still work in progress. essentually its just the .gravitydir field, with updated offsets all over the place. IIRC there is a mod with ceiling-walking vores (Quoth?). I suppose it would be feasible in vanilla engines with custom models and messing wih the .gravity field alone. Here's another shot of them. These are now in q3bsp. Lighting is definitely more interesting with better shading on the models and Bump/Specular effects on them without RT lights. I thought I'd simplify some player stuff and only have the lower HUD. If I ever do a HUD with CSQC, I'd only do some minor tweaks to it, like that spacing between the numbers is way too big. You could fit 5 numbers in each display, or 4 with little space between. If I make all the graphics for the upper HUD transparent.. that should make the upper HUD not display at all? Are the small HUD numbers from confont used anywhere else? Yea, the fake shadows kinda do that... I tried changing the shadow throwdistance, but that didn't help with this sort of thin bridges. Here's some more.. with better UV map and texture, and some glow in the eye/mouth. Also got a few frames of animation to try out the skeleton. I wanted to get more animations done, but UV map tweaking took longer than expected, the first UV map was so horrible that I had even drawn the bottom side backwards! It had abs in the chest and chest/throat joining into the tail... No wonder the bottom side looked a bit weird. hey i was looking at your new enemies, you should make their texture look more grimey and what not like the other monster models. these ones look really clean. They will probably have some damage textures and maybe their skin is the kind of material that doesn't get dirty easily? Like reptile skin. Those are probably some form of scales on the top of the head/back. Though it's not exactly clear if the other same color parts are scales, muscles or is it some exoskeleton like Alien? I named them as "Mantis" in the player death messages. They look like a mash up of animals, something between insectoid (because their heads) and amphibian/reptilian (because the skin patterns ressembling chamaleons). I think they are OK as is. Well, here's a video of them animated, etc. They don't have new sounds or gibs yet, and don't jump into ceilings (but they have ceiling crawl animations). Doesn't include the unanimated monsters either. I also disabled whatever I had going on in the upper HUD, didn't seem like adding anything interesting to the gameplay. 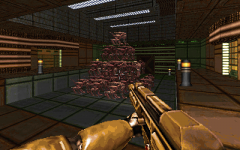 So, this project changed to a modified Chocolate-Doom engine (what do I write on the thread engine tag?). 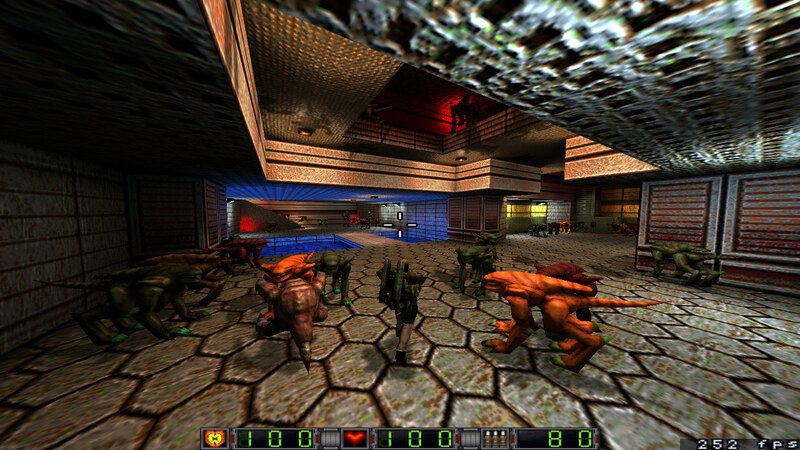 Trying to get DarkPlaces to look paletted/software Doom like just doesn't seem to work so well. 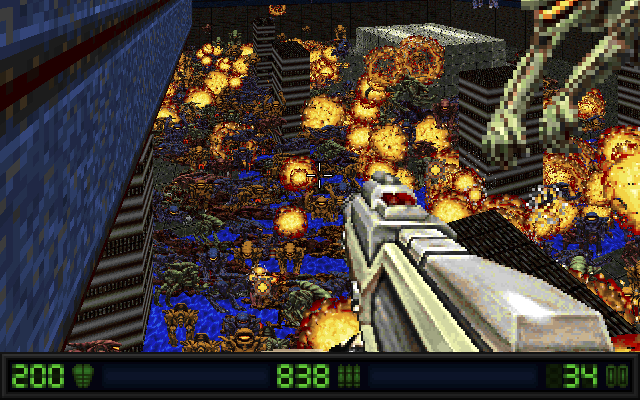 And now there can be hundreds of aliens/things on screen without lags. Mmmm... I think I can program any gameplay related feature into it, but some level editing or rendering features may be too difficult for me. 640x400 resolution. Mouselook. Possibility for smoother/colored/overbright lighting. 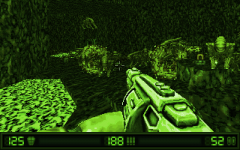 Player got a night vision mode. It use some energy. Shared with running, and later some other power ups. Movement speeds may change. Player can also jump and have air control. And Forward+Strafe doesn't increase player's movement speed. I've been doing some improvements on the models, since they're sprites, there's no need to worry about them having too much polygons. So far I've done this for 4 weapons. The models are made so that they can be reloaded. Reloading may be an option or difficulty setting. 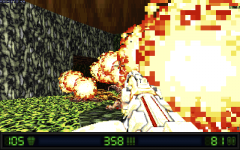 Self damage from own explosions could also be a difficulty setting. Possibly the difficulty settings would be totally customizable. Guided rockets can be guided with the "crosshair" for a while. Enemy guided rockets guide shorter time. In deathmatch player's guided rockets guide time gets halved. The things can be over/under each other without any problems. Including making some crazy pyramids out of them. There is probably no limit how many can be piled. The only thing missing from this stuff is stepping up/down to another thing if the step is 24 or less. Of course for player or dropoff flagged aliens stepping down is no problem. Also the monsters no longer insta step/drop down, they fall. Weapon damage can now do Z thrust. So, you can teach them the superman! The game also runs at 40 tics per second. 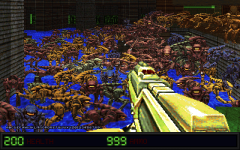 35 ticrate of Doom has always felt a little strange. The HUD has been changed from what it was on DarkPlaces. It's kinda placeholder. It could display some more stuff on it, or if it's just the 3 values in it, there could just be smaller 3 boxes for the numbers/icons instead of a screenwide statbar. 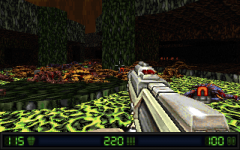 I think this level was more fun than what I had in DarkPlaces.. and would have taken ages to make with Radiant, even if I used Doom like level geometry. 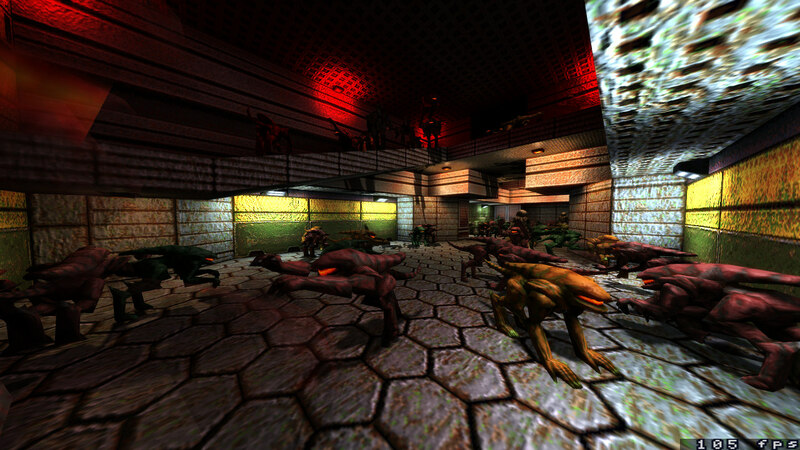 But other than the slow speed, Quake mapping is kinda fun too. Levels can easily become very vertical. Yea, and my other project will continue with DarkPlaces. Don't know when. There may be some content shared with the projects, like the alien sounds are same in both. couldnt you just simply follow a strict palette ? All the textures were in the game's palette. I then tried to get all the ingame colors use it with glsl, but that was just so slow. With some crazy if/else jungle I was able to get some 80 colors without too much performance loss. In my other project I also tried some light boost/diminishing with a dynamic light, and sort of multiplying all colors with glsl, so it gets kinda dark, but that didn't work exactly as I wanted. The main reason for the change was to have lots more monsters on screen and actively chasing/attacking player. i could see the monster limit thing being worth while. but instead of using glsl why not just use external tgas that are set to the palette you're looking for? the biggest problem then would be the mood with the lighting. i also like paletted / retro looking games. so i get where you're coming from for wanting a specific style. gl. Why not use a software Quake engine like Super8 or Engoo?